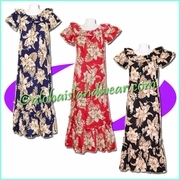 Hawaiian Muumuu dress , traditional Hawaiian dress, island dress. This Hawaiian Muumuu is Hawaiian tradition dress among Hawaiian fashion, it’s designed on pull over style in full length with a flounce hemline, round neckline with elastic and a side pocket. Great dress for Hawaiian wedding, Hawaiian luau, Hula dance or casual wear.